Get powerful Workshare features integrated with your iManage solution. Everything you need to complete file comparisons, protect client data, detect sharing risks, and collaborate effectively on matter files is integrated in iManage. Use market-leading comparison technology from Workshare directly in iManage. Run the fastest comparison possible using Workshare. 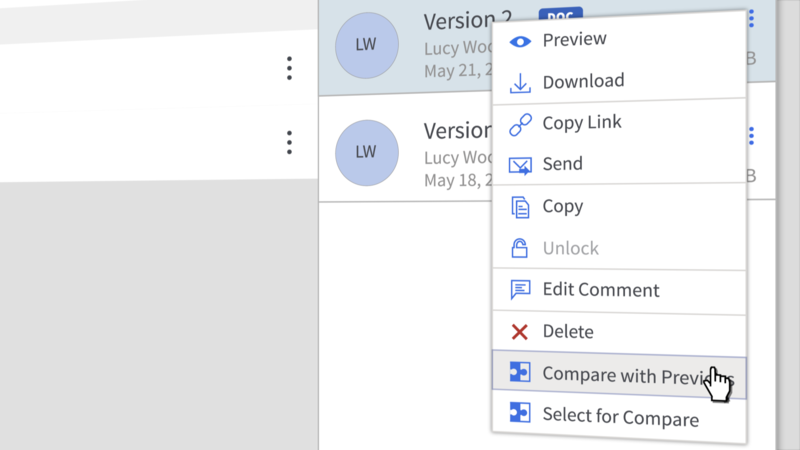 See exactly what’s changed in your file in seconds. Every difference between the 2 versions you compare is shown. No matter how small the change. Long, complex documents, tables and images are all included in your redline. Feel confident no change will ever be missed. In iManage FileSite or DeskSite, right-click your documents to select them for comparison. The redline opens in Workshare Compare Desktop, where you can see any changes and save your comparison back to iManage FileSite or DeskSite. Initiate a comparison by opening the Workshare Compare application on your desktop. Select 2 files from iManage and run a comparison to see what’s different. Then save your redline back to iManage. Select documents for comparison in any of the new Work 10 interfaces. Open your redline in Workshare Compare desktop or Workshare Compare Online. Quickly see what’s changed in a file. Then save your redline or new version back in Work 10. Complete security for your legal work product from iManage and Workshare. 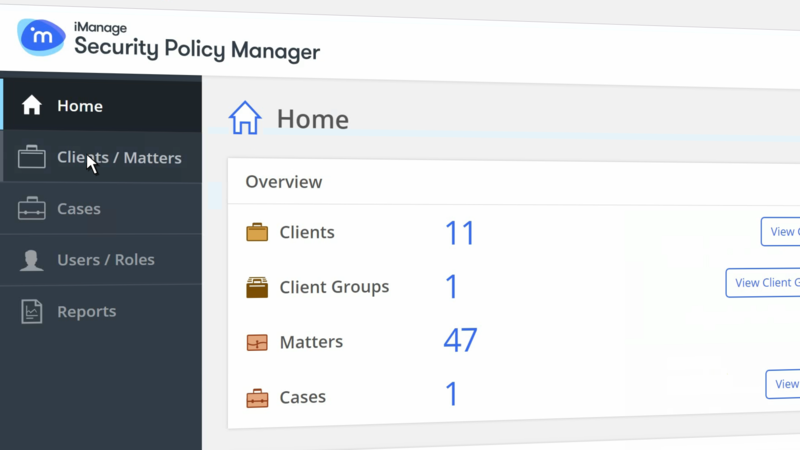 Combine iManage Security Policy Manager with Workshare Protect. Apply specific security policies across your legal enterprise. Access to data is under your control, whether shared from the DMS or email. Proactively stop files going to unauthorized people or email domains. Use Workshare Detect integrated with iManage Threat Manager. Receive reports showing unusual sharing behaviors that pose a risk to your firm. Prevent data loss from accidental sharing or malicious attack. Take action based on real events and continually improve security. Set email security policies to enforce ethical walls and prevent files going to the wrong people. When a user emails an attachment from iManage Work, security policies are automatically applied. These policies restrict access to specific domains, groups or people. Policies can be set on the user’s desktop with Workshare Protect or on Exchange with Protect Server. Workshare Detect integrated with iManage Threat Manager gives those responsible for data security regular reports on matter files shared over email. Spot unusual sharing behavior or suspicious patterns for further investigation. Take action to neutralize threats. And, fine-tune security policies based on learnings. Any deal closing is made more efficient with Workshare Transact integrated with iManage. Upload files from your DMS into Workshare Transact quickly during a deal closing. Your online checklist is integrated with the iManage environments. Efficient and secure file exchanges between the platforms from start to finish. 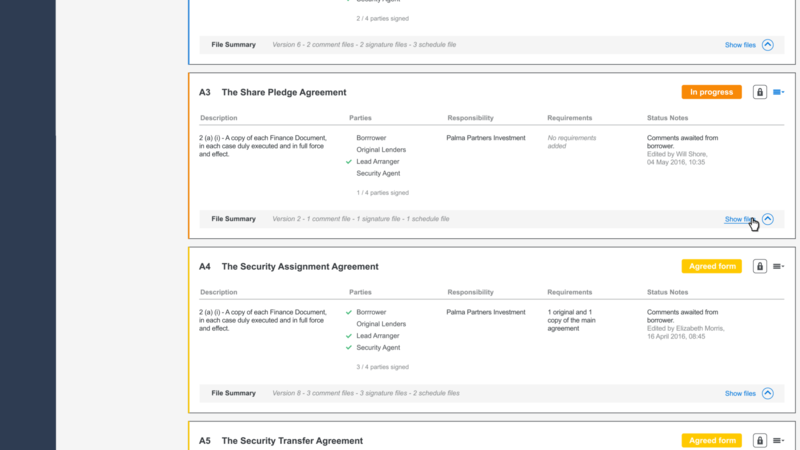 Select files to load into your deal checklist from iManage. Equally, you can save deal files directly back to iManage from Workshare Transact. The 2-way integration is fast, secure and seamless. If you are an iManage user, you can start using these integrations today. Call us and we can discuss the right Workshare solution for your business. 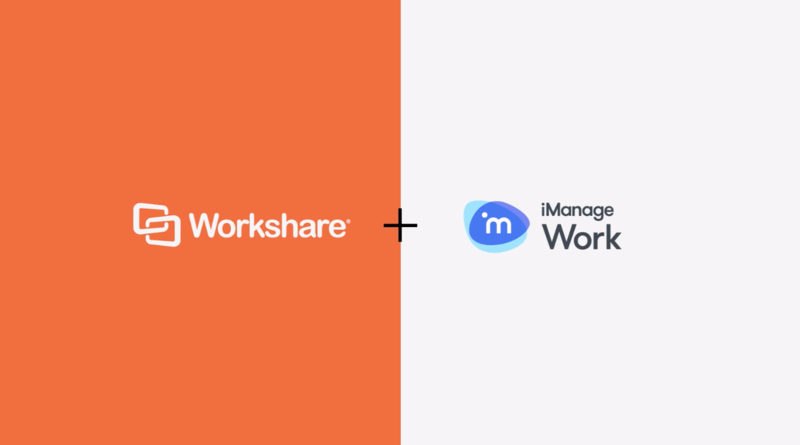 If you’re not using iManage yet, you can still get Workshare Compare, Secure and Transact. Just use them with your local file system. Once you’ve chosen your DMS, you can start using the integrations. It’s all included in your download. iManage gives users a rich platform, making it easier for technology providers to leverage iManage Work 10 to create a seamless experience. 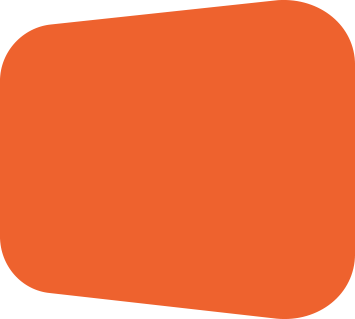 We’re really pleased to see how Workshare has used APIs to embed the full experience of their product, which will not only benefit the end users, but will also make upgrading easier for our shared customers.